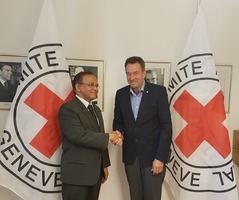 The Permanent Representative of Sri Lanka to the United Nations in Geneva met with President of the ICRC Mr. Peter Maurer at the ICRC Headquarters today. Referring to various measures taken by the Government of Sri Lanka to address humanitarian aspects involved in peacebuilding and reconciliation, Mr. Maurer noted the recent progress achieved in establishing and operationalizing the Office of Missing Persons (OMP). Ambassador Azeez conveyed the appreciation of the Government of Sri Lanka for technical assistance provided by the ICRC particularly at the preparatory stages of work relating to draft policy and legal framework and structure of OMP. 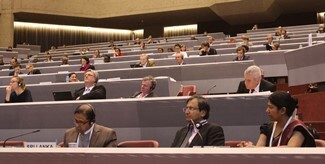 Mr. Peter Maurer commended Sri Lanka for becoming a State party to the Anti-Personnel Mine Ban Convention (Ottawa Treaty) and the Convention on Cluster Munitions (Oslo Treaty), which he noted “sent a positive signal regarding the range of commitments that Sri Lanka has undertaken in humanitarian disarmament”. 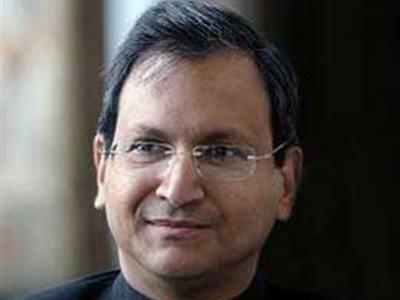 Ambassador Azeez said Sri Lanka looked forward to further cooperation with the ICRC on technical expertise and capacity building in areas of shared priority. 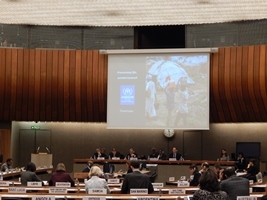 Sri Lanka pledged an un-earmarked voluntary contribution of 15,000 US$ towards the UNHCR Global Appeal 2018-2019 at the UNHCR Pledging Conference held on 05th December 2017 in Geneva. 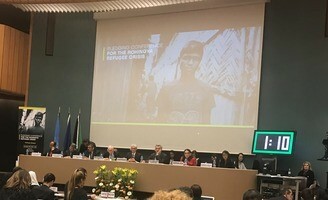 The Global Appeal 2018-2019 by the UNHCR presents the requirement of financial resources that amounts to USD 7.508 billion for 2018 and USD 7.352 billion for 2019, to protect and improve the lives of millions of people, including refugees, asylum seekers, internally displaced people (IDPs), returnees, stateless people, and others of concern. 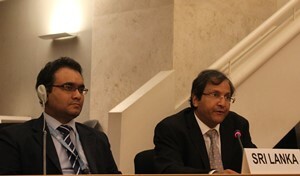 Addressing the UNHCR Pledging Conference, Ambassador Aryasinha appreciated the assistance extended by UNHCR to Sri Lanka in the resettlement process of IDPs and returnees in the provision of shelter, livelihoods and basic household items and assured Sri Lanka’s cooperation to Mr. High Commissioner for his endeavours. Sri Lanka has pledged US $ 50,000 towards the fund to assist the Rohingaya refugees and the host community in Bangladesh. This pledge was announced by the Permanent Representative of Sri Lanka to the UN Ravinatha Aryasinha, at the Pledging Conference for the Rohingaya Refugee Crisis held today (23.10.2017) at Palais des Nations in Geneva. Sri Lanka commended the Government of Bangladesh for hosting the Rohingaya refugees including the recent influx, under challenging conditions. It was noted that the humanitarian exigencies of the Rohingaya refugees have to be the shared responsibility of the international community due to its sheer magnitude. 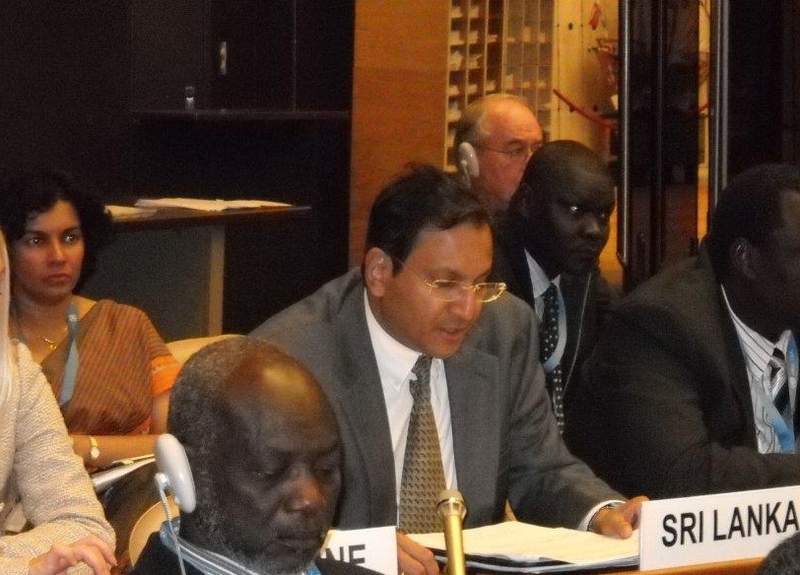 68th session of the Executive Committee of the High Commissioner’s Programme (ExCom) of the United Nations High Commissioner for Refugees (UNHCR), held during the period 2-6 October 2017 in Geneva at the United Nations. Ms. Rosemary McCarney, Canadian Ambassador and Permanent Representative to the United Nations chaired the meeting with the presence of High Commissioner of UNHCR, Mr. Filippo Grandi. 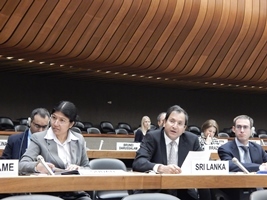 Ambassador Ravintha Aryasinha, Sri Lanka’s Permanent Representative to the United Nations made an intervention under the general debateof 68th ExCom. 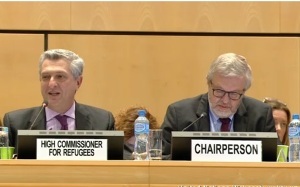 The UN High Commissioner for Refugees Filipo Grandi, has said the UNHCR “will continue to work on, the return of those Sri Lankans that wants to return, solutions for internally displaced people and commendable work that the Government is doing for the statelessness”. 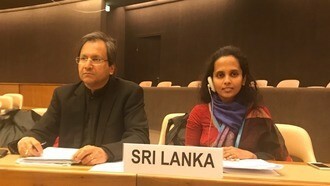 The High Commissioner made this observation, in response to the national statement of Sri Lanka delivered by Sri Lanka's Permanent Representative to the UN in Geneva Ravinatha Aryasinha, at the 67th Session of the Executive Committee of the UNHCR, held in Geneva this week. 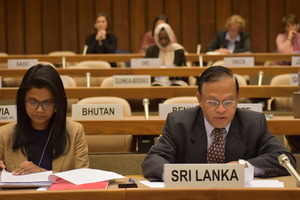 Addressing the 63rd Session of the Executive Committee of the UNHCR on Tuesday (2 October) Sri Lanka's Permanent Representative to the UN in Geneva Ambassador Ravinatha Aryasinha said, "those who downplay the significance of Sri Lanka's post-conflict achievements and constantly keep shifting goal posts, show disrespect not only to Sri Lanka and its international partners whose steadfast commitment to this task has made these achievements possible, but also to those who have at last emerged from the suffering caused by 30 years of terrorist conflict". Sri Lanka is a country with an established tradition of democratic government. 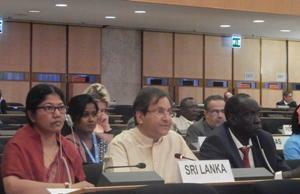 Fundamental rights are guaranteed in our Constitution and every organ of State is under a duty to respect, secure and advance these rights and freedoms said Hon.Minister Mahinda Samarasinghe addressing the meeting held in the UN Office in Geneva on 17 July to launch the "Humanitarian Appeal 2007: Mid-Year Review" organised by the UN Office for the Coordination of Humanitarian Affairs in Geneva. Hon. Minister was present at the occasion on the invitation by Mr. John Holms, UN Under-Secretary-General for Humanitarian Affairs and Emergency Relief Coordinator. 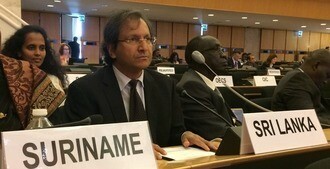 The Mid-Year Review of the 2007 Common Humanitarian Action Plan of the UN requests the international donor community to contribute US$ 98 million towards humanitarian operations in Sri Lanka. I would like to begin with by expressing my Delegation’s sincere appreciation for the excellent work done by the UN Secretariat in preparing for this meeting. At the same time I thank you in leading the efforts of this important Humanitarian Affairs Segment in this years’ substantive Session of ECOSOC.